We'd love to get to know you and walk with you in our journey of discovery. Please let us know a bit about you and one of our staff will reach out to you soon. Pastor Jason was born and raised in Sugar Land, Texas, just outside Houston. His dad is Taiwanese and his mom is Singaporean (although he's totally open to being spoken to in Konglish). Jason didn't grow up a Christian, in fact the opposite. He was the kid who argued and fought with those who were religious. But in a journey of science and revelation, Jason came to know and believe the Gospel his senior year of high school. This caused him to love sharing and debating the Gospel with high school students. Jason went to the University of Southern California and studied film production, during which he became a member of ANC. He started as a pastor at ANC in 2009, and has worked in both Junior High and High School ministries. He obtained his Masters of Ministry at Harvest Bible University in downtown LA and was ordained in February 2018. Jason loves movies, television, comics, board games, football, hockey, and video games. He's a huge super-hero geek. 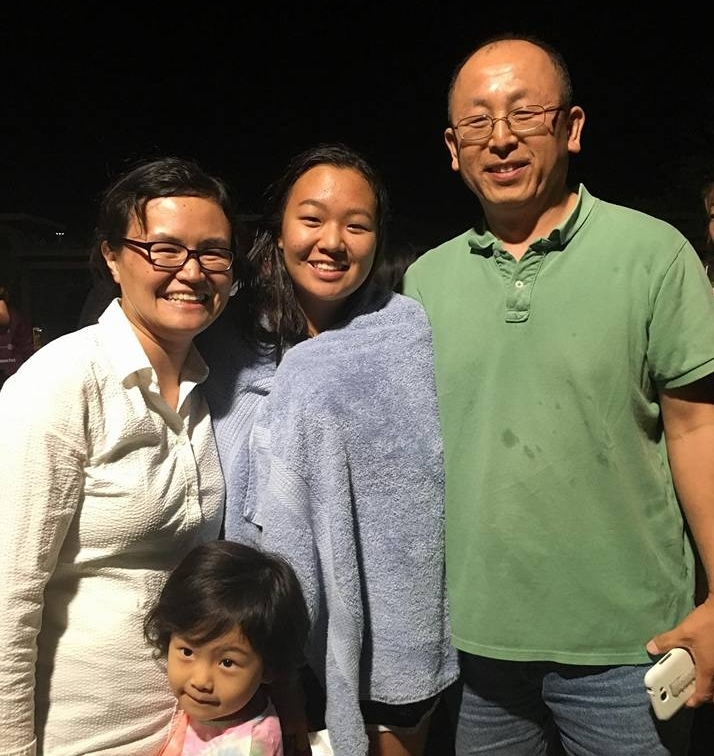 Pastor Jason is married to Hannah and has two children Evangeline Grace Chao and Abigail Blessing Chao. Faith Kang has been a part of our staff since 2007. She has consistently led our Northridge Life Group and has served as our superintendent since 2015. She is the head of human resources for California Chicken Cafe. Faith and her beloved husband have three beautiful children, Caleb, Annette, and Esther. Our ministry interns are dedicated members who love our students and are being trained to do ministry, make disciples, and teach the Gospel. Eunice Lim is a graduate of UCLA and is currently preparing to apply for medical school. Soyoon Lee works for One Voice Student Missions, is a graduate of YWAM (Youth With a Mission), and is currently studying art. Sam Jeon is a graduate of UCLA and is currently applying to law school. Our church's overall vision is to make disciples of Jesus in every generation. We see high school as a focal point of that vision. Our high school students are uniquely positioned to find and develop deep Christian relationships with mentors above them and to be mentors to those younger than them. Our desire is for our students to experience genuine life change through a growing relationship with Jesus. Our hope is that you would know Jesus intimately and make Him the priority in your life. We believe the most important thing the church can provide to help you with this is to connect you into an authentic and intentional discipleship making family. It's hard for us to measure your own personal relationship with God, but we do know that a good indicator of a healthy Christian life is healthy Christian relationships (1 John 3:11-18). The best way to see this play out in your life is what we call the 3x3x3 model. The question is whether you can say that you have 3 intentional mentors, 3 real friends, and 3 authentic disciples in your Christian life. An intentional mentor is someone whose life you want to emulate as they follow Christ (1 Corinthians 11:1). It's someone who you meet with regularly, talk with openly and honestly, and who can challenge, guide, and advise you in the Christian Life that God has for you. This is of utmost importance for all of us because none of us know how to perfectly live our lives. We need people to help us see the paths before us, the grace today, and the redemption in our pasts. Our main way to help you find these mentors is Friday Night Life and Home Life groups. However, we also encourage you to find these mentors in your parents, in other ministries, and by participating in activities with our college and adult ministries. Real friends not only spend time with you and have shared hobbies, but are honest with you about your flaws (Proverbs 27:6 & 17), keep you accountable in your struggles to improve (Proverbs 17:17 & 18:24), remind you of Jesus' Grace (Hebrews 10:25), and share real Christian fellowship (Amos 3:3). We understand that this can be hard to find at a church of our size, especially on a very rushed Sunday. We hope that you understand that God truly wants to bless you with a great Christian community and we hope Christ First Student ministry can be that place for you. Retreats and life groups are a great way to start engaging new people and opening up to new friends. Jesus doesn't just save us for our own benefit, but so that we can also be a light to others (Matthew 5:12-16 & 2 Corinthians 1:3-11). Therefore for healthy Christian growth we need to be engaged in making disciples that can follow us as we follow Jesus. We highly encourage you to participate in our Junior High, KidzWinc (Elementary), AWANA (Sunday after church) and Vacation Bible School (VBS or elementary summer retreat). For more info please contact us and we will refer you to the correct department. All Nations Church's ministers mostly to three local communities, each a valley: Crescenta Valley, Santa Clarita Valley, and San Fernando Valley. Each valley has life groups and will have their own fellowship activities to help students connect and grow together. We encourage you to join each region's facebook group for updates and information. 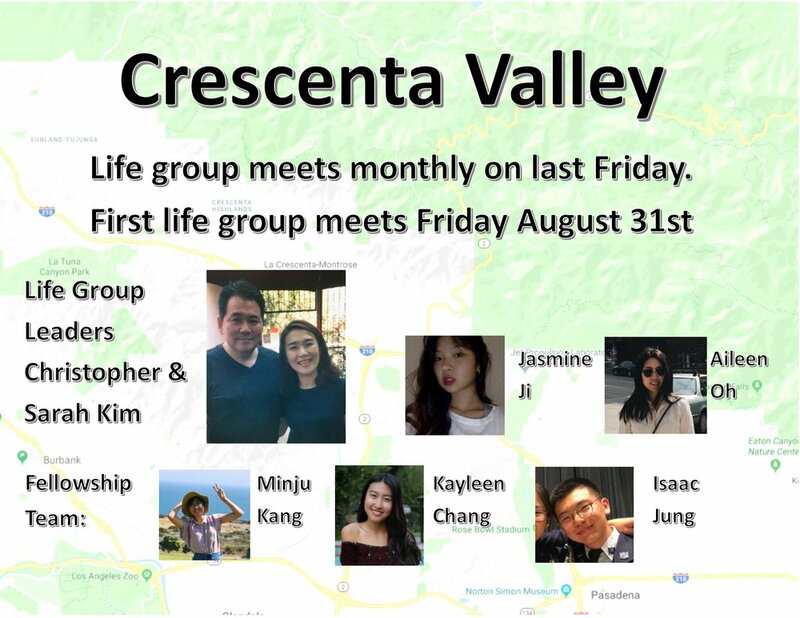 Crescenta Valley Home Life Group. 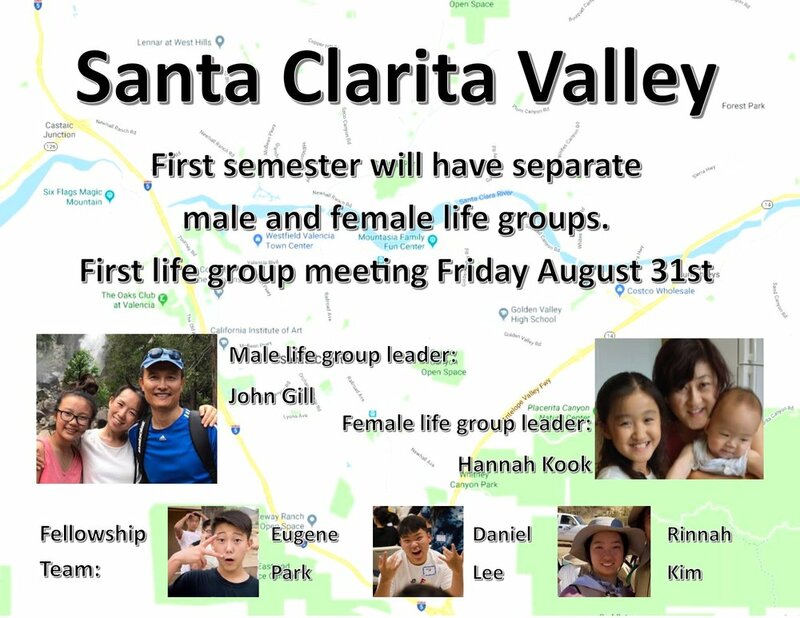 First meeting is Friday August 31st and is hosted and led by Christopher and Sarah Kim. San Fernando Valley Home Life Group. Santa Clarita Valley Home Life Group. First meeting is August 31st. For the first semester of 2018-2019, we will be having separate male and female life groups.